Divorce is never easy, but if one has to go through the process while serving in the military, it can be even more difficult. 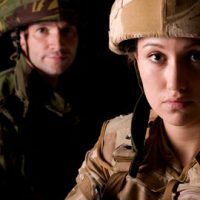 Military divorce can have a number of different procedures that are not present in civilian divorce, and it is critical that you understand them before proceeding. If not, you may miss out on benefits or end up with complications. It is important to keep in mind that if you are deployed, you may be able to have proceedings delayed, though this is not always true. If you are on active deployment (and thus might be unreachable for long periods of time), the Servicemembers’ Civil Relief Act (SCRA) has a provision that may allow for any civil proceeding involving a servicemember to be suspended for 90 days. This is so the military servicemember is not unfairly penalized with default judgments against them while they are quite literally unreachable. To obtain relief under the SCRA requires certain specific actions be undertaken by the service member as soon as they become aware of a legal proceeding. If you are not in a position where you are unreachable, though, the proceedings are more likely to be allowed to go forward, provided you are able to be served with notice. The crux of the matter is that it is up to you whether to ask for a stay or to proceed. Another major difference between civilian and military divorce is the attitude toward property division and alimony. One common bone of contention with military divorces is the servicemember’s retirement pay – until 1981, the general rule was that a spouse was not entitled to any measure of the servicemember’s retirement benefits, but upon the passage of the Uniformed Servicemembers’ Former Spouses’ Protection Act (USFSPA) this changed. The USFSPA does not automatically award any percentage of retired pay to a spouse, but it gives state courts the jurisdiction to do so. While many misinterpret the law to state that you are only entitled to part of the servicemember’s retired pay if you have been married for a certain amount of time, this is not actually the case. In order for your portion to be disbursed straight from the military’s Defense Finance & Accounting Services (DFAS), you must have been married for at least 10 years. However, if a state court order grants you part of your ex’s retirement pay, this can still be enforced even if you were married less time; it simply means that you would receive that amount in another way. Juggling military life with divorce proceedings, especially if kids are involved, can be a tall order for anyone. If you are going through this, contacting an experienced and compassionate attorney is a good idea. The Kainen Law Group has been handling military divorce cases for years, and we understand that details matter. To schedule an appointment, contact our offices in Las Vegas at 702-823-4900.